In the thirty years that Jim Sanderson has been writing seriously, he has been given many labels. He went from being an "aspiring writer" to a "working class, Texas" writer when he won the Kenneth Patchen Prize (92) and had his short story collection, Semi-Private Rooms, published (Pig Iron Press, 1995). With the publication of his essay collection, A West Texas Soapbox (1998, Texas A & M Press), he became a Texas humorist and essayist. When he won the 1997 Frank Waters Prize (given for the best novel about the southwest), he was a new "rural Southwestern literary writer." When the novel that won that prize, El Camino del Rio (University of New Mexico Press, 1998) came out with his editor’s label as a "mystery" and was subsequently reviewed in the Washington Post and New York Times as a mystery, he became a mystery writer. 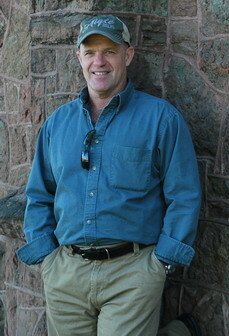 With the University of New Mexico Press’s publication of two more novels, Safe Delivery (2000, Violet Crown Award finalist) and La Mordida (2002), he became a "literary mystery writer." With the publication of Nevin’s History (Texas Tech University Press, 2004), he became a "historical writer" or a "Western writer." With Faded Love, he returned to being a short story writer and was honored by being a finalist for the Jesse Jones Award for the best book-length fiction by a Texan or about Texas, sponsored by the Texas Institute of Letters in 2010. Sanderson lets others choose his labels, but to him, Dolph’s Team is another in his literary-mystery series.